Our First Peter Kenny Memorial Shoot was held on Saturday 9th February 2013 at John Ashby Sports Hall, Moulton College, Northampton. Shooting a Worcester Round, the event was a fantastic success with 40 archers taking part. After the shoot, members enjoyed lunch, butties and tea in the cafeteria at the college. Trophies and medals were then presented to the winners by Peter’s widow, Yvonne, and son and daughter, Craig and Nicole. 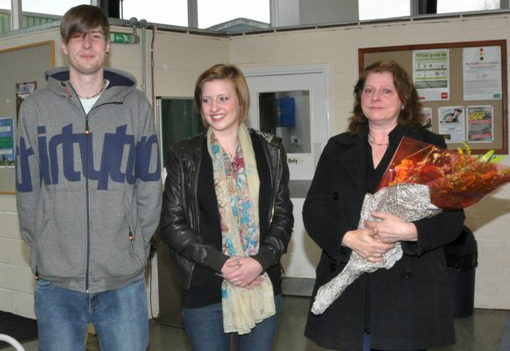 All had a great time in memory of Pete, and NAC felt proud to meet his family. Pete Kenny joined Northampton Archery Club at the end of a beginners course in 1994. He asked to to have a go with a 85-95lb longbow, and despite being advised against this, insisted on shooting. He amazed Pete Bond and Paul Barrett as he shot into the gold at 30 yards – and not just once. Not content he then had a go at 60 yards and stunned the onlookers again when he struck gold again twice. Once a member Pete went from strength to strength shooting for NAC and at other competitions. Sadly Peter was taken from this life at early age and died from a heart attack whilst fishing. The Shoot on Saturday at Moulton will now be held as annual event. Our thanks go to all who helped making the day so great.